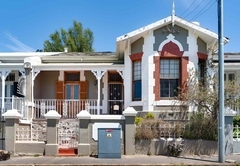 29 Antrim Road is a property providing self catering in Green Point for up to 7 guests visiting the Atlantic Seaboard region. 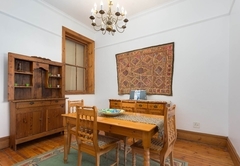 Situated in the vibey area of Green Point, 29 Antrim Road is a quaint three bedroom villa that provides self catering accommodation for seven guests. 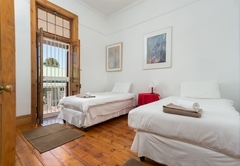 The main bedroom is furnished with a Queen-size bed and has an en-suite bathroom with a shower. 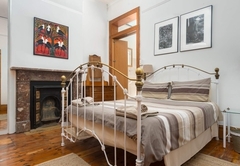 The second bedroom has two single beds and the third room has both a double bed and single bed. 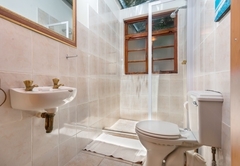 These two bedrooms share a bathroom with a bath. 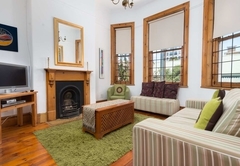 The villa has a lounge / dining area which is situated at the front of the house and boasts gorgeous bay windows. 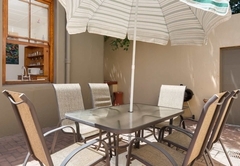 The fully equipped kitchen is at the back of the house and looks out over the private patio area which is equipped with a Weber braai and outdoor furniture. Green Point is well known for its cafe’s, shops and restaurants which are within walking distance of the villa. The Sea Point promenade is five minutes walk away and the V&A Waterfront is 15 minutes walk away. 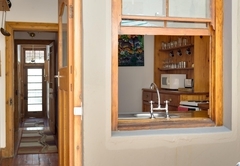 A short drive will get you to the beautiful beaches of Camps Bay and Clifton. The main bedroom is furnished with a Queen-size bed and has an en-suite bathroom with a shower. 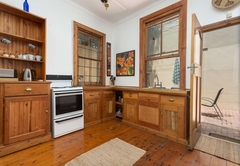 The second bedroom has two single beds and the third room has both a double bed and single bed. 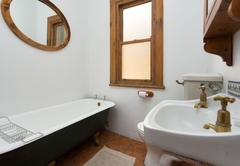 These two bedrooms share a bathroom with a bath.